In December 1997, Mercy has been enhanced with the option Criteria. This option makes it possible for the user to choose his or her own Mercy criteria. This was to be the end of the 5-year-long process of coming to understand of what really people expect from Mercy. The following sorting criteria can be balanced by the user: item importance (as indicated by the ordinal and the forgetting index), repetition lateness, investment (in the item), easiness (of the item) and recency of introducing the item to the learning process. 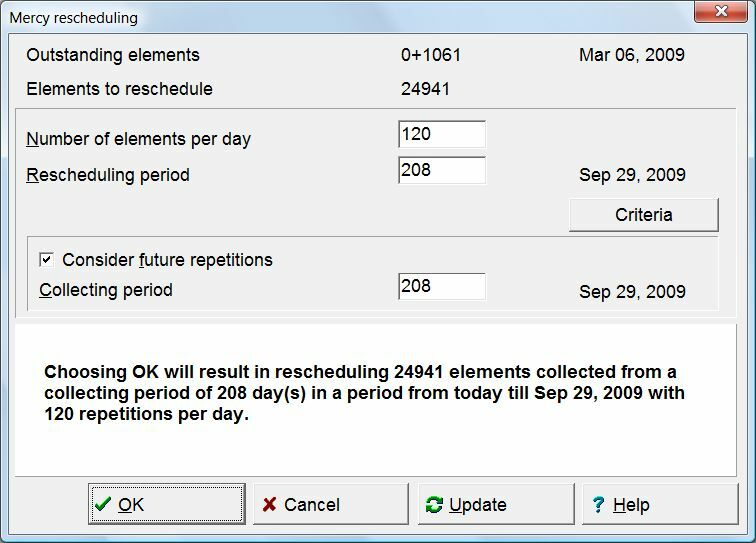 SuperMemo 2000 added a powerful rescheduling tool that can be branch/subset-specific: Postpone. In SuperMemo 2002 Postpone became even more content and priority sensitive. This gradually reduced the need for using Mercy. In Incremental reading, Postpone is the tool of choice for resolving material overload. Mercy would only be used occasionally, e.g. to spread the load of repetitions, randomize repetitions, advance future repetitions, etc. It no longer played a central role in learning.